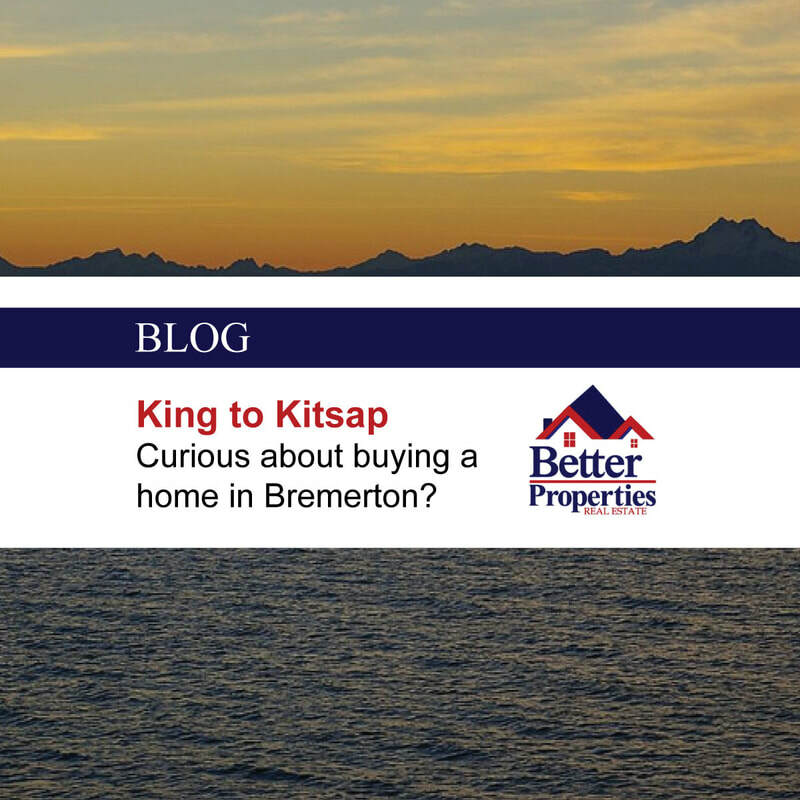 King to Kitsap: Curious about buying a home in Bremerton? If you’re going through one or more of the big life transitions -- like career changes, marriage, starting a family, or even getting a new pet -- you’re also probably reconsidering your living situation in Seattle. Tight spaces, expensive homes, and close neighbors can all influence the choices you’re considering making for your rapidly changing life. You might be curious about buying a home in Bremerton as you expand your home search. Thanks to improved commuting options and low median cost of homes, it’s time to take a closer look. Our community is growing -- and our amenities are expanding to serve the population. This is a guide for those of you doing research on what communities make sense for the next stage of your growing, changing lives. I wonder too, Cary. Let’s find out what’s going on in Bremerton to see if it’s something you should consider too. Priced out of Seattle’s Housing Market? At just over half of what you’d pay for a home in Seattle, affordable homeownership is the #1 reason buyers are looking to Kitsap to realize their dreams. But these prices won’t last forever -- and as our little bedroom community is discovered (thanks, in part, to the press about ease of commuting on the fast ferry [http://www.seattletimes.com/seattle-news/transportation/bremerton-takes-another-crack-at-fast-ferry-service/]), things will start moving even faster. Speaking of the fast ferry, getting to Seattle is now easier than ever. With commute times as low as 28 minutes by fast ferry and 55 minutes by car ferry, you can skip traffic and literally float to work. Ferry commuting offers stress-free travel that allows you to work, rest, or relax on your way to and from Seattle. Thanks to food and beverage service on the boats, you can enjoy a glass of wine or craft beer on your way home while enjoying the company of the ferry community. If you’re a whale watcher, commuting by ferry is a boon: the odds are good you’ll spot them at some point during your commute. Seals and incredible views of Mount Rainier are a near-daily occurrence, and you’ll catch views of the odd submarine and aircraft carrier as a bonus. Even for lovers of the bottom-line, the ferry commute makes good financial sense. The trip via fast ferry from Bremerton will cost $12 for a round trip, or $168 for a monthly pass -- far less than most reserved monthly parking in the downtown corridor. Bremerton is a unique town that reflects an unusual combination of influences, guaranteeing your experience here will be one-of-a-kind. People who move here from Seattle are one segment of the population, certainly, but the area is full of people who live here for all kinds of reasons. Puget Sound Naval Shipyard (PSNS), located adjacent to the Bremerton waterfront, is a 173-acre naval maintenance facility and one of the area’s largest employers; many of its civilian employees and their families call Bremerton home. Combine those communities with active servicepeople (and their families) brought to town by docking Navy ships and you’ve got diverse perspectives galore! Aircraft carriers bring a little bit of the world to your doorstep when families from all over of our great country (and who have traveled all over the world) settle into our community. You might live in a mini-metropolis when you live in Bremerton, but you’re surrounded by an impressive amount of nature. If being outdoors is your passion, I invite you to start on the Kitsap Peninsula. You have the Olympic Mountains to the north, the Pacific Ocean to the west, and even in town you can barely throw a rock without hitting trails, hills, and nature preserves. From expert hiker to family trail explorer, there is something for everyone. Here are a few resources to help you explore the natural beauty that the peninsula has to offer! If you’re interested in seeing more Bremerton sights before you commit to a ferry ride over, you might enjoy the video created by our mayor last year. It helps give people an idea of what Bremerton has to offer -- take a look! Move To Bremerton featuring Mayor Lent from BKAT TV on Vimeo. If you're ready to dig into what you need to be a prepared home buyer, read our article: Ready, Set, Go: Seattle Home Seeker's Guide to Buying in Kitsap County. Or if you’re ready to come see us, my team has put together a free home tour to show you and your family around Bremerton. Grab your ticket for this exclusive tour! Join us on October 14th or September 16th.